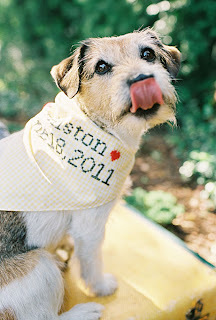 A few years ago, after being contacted by an editor at Brides.com for a story on wedding accessories for dogs, I made custom cross-stitch dog bandannas for a few customers. 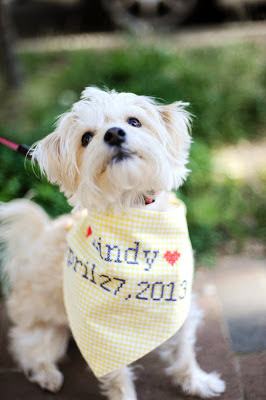 Recently, one of my customers shared these adorable photos of her dog, Mindy, wearing the bandanna I had stitched up for her. Both bandannas were made with yellow gingham and purple embroidery floss. 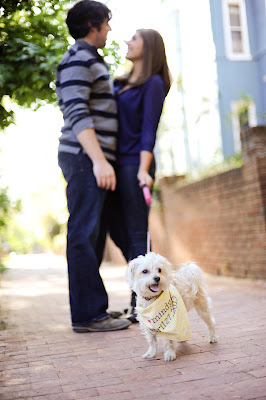 You can see one of them in action in this engagement shoot, and see past bandannas here and here.